Excellent performances and a unique approach balance out a weak script. Joseph Merrick, also known as the Elephant Man or John Merrick, is a hot topic in the theatre, what with Bradley Cooper’s imminent transfer to the West End in this title role. 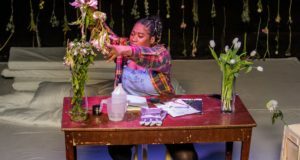 Despite this news, the current, smaller scale production at the Jack Studio Theatre in South London is certainly worth seeing, even if you plan to see the commercial incarnation this spring. 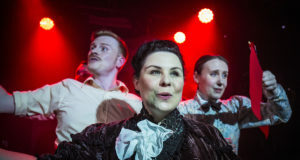 In his original adaptation, writer and director Steve Green confronts audiences with the uncomfortable social history of ownership, entrapment and public appearance in the Victorian era. Actor Daniel Christostomou plays Merrick as a sensitive, articulate young man caged by his physical deformities and Victorian attitudes. 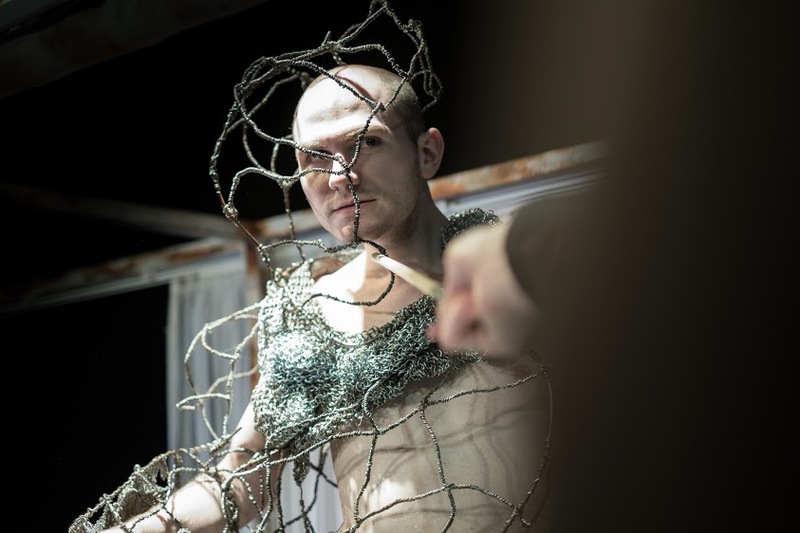 Rather than prosthetics or make up, costume designer Anastasia Sarajeva has created an evocative, confrontational structure of wire, chain link and mesh for Chrisostomou. Naked underneath, we see both the actor’s and Merrick’s silhouette. Initially, Merrick does not speak. He grunts and wheezes and groans his way through ill treatment by the freak show “manager,” Tom Norman. It is not until surgeon Frederick Treves discovers Merrick, purchases him, and gains his trust that Merrick talks. He is well spoken, kind and virtuous. In reality, Merrick’s speech was all but unintelligible due to his facial deformities, but this artistic license can be forgiven in the name of contrast to the play;s population of despicable characters. Steve McGarrick’s portrayal of Frederick Treves is warm but scientific, showing the character’s conflicting inner life. He genuinely cares for Merrick, but also has a sense of ownership for the man and wants to “keep him” in hospital for the sake of medical research. This is thinly veiled as concern for Merricks’s wellbeing. 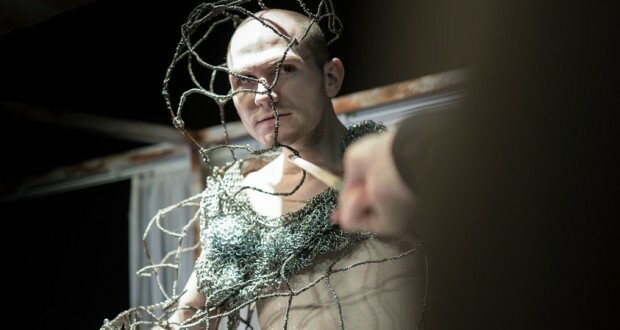 Adam Trussell’s Tom Norman keeps Merrick in a caged bed, but believes he “gives him the freedom to earn a living” as a freak show specimen in a Whitechapel shop front. Trussell also portrays Dr Reginald Tuckett, a deeply disturbed colleague of Treves. Trussell’s characters are very similar to each other, which unfortunately doesn’t allow him to show much range as an actor. Amy Sayers and Katie Turner also play a range of characters in Merrick’s life. Many of these characters are also caged, but by prejudices and attitudes that prohibit them from seeing Merrick as fully human. Despite Chrisostomou’s incredible performance and the unique approach to Merrick’s experience, the script falls short. The writing is choppy, with large gaps in time and no explanation of what events were excluded. Individual scenes are well-crafted, but not pieced together to form a particularly effective whole, and I found myself needing to read up on Merrick after the fact to clarify plot holes. There are two projected sequences, but they seem arbitrary and would not have been missed if excluded. Regardless of the confusing and unpolished script, the characters and the performances still make this a production worth catching. They evoke a range of audience emotions: sympathy, guilt, curiosity, admiration and reflection, and there is clearly great value in the emerging talent on the stage.